The Moto E is the most interesting addition to that list. However, it seems like it'll only get it in select markets and what do you know, the US isn't one of them. Confused? So are we. Outraged? Get in line. We're all crossing the border to Canada together. The other devices are Motorola's recently released Moto X Force, its US brother the Verizon DROID Turbo 2, and the DROID Maxx 2. Frankly, we were shocked that these even launched with Android 5.1 instead of 6.0 to begin with, so we're not that surprised to see them make the list. 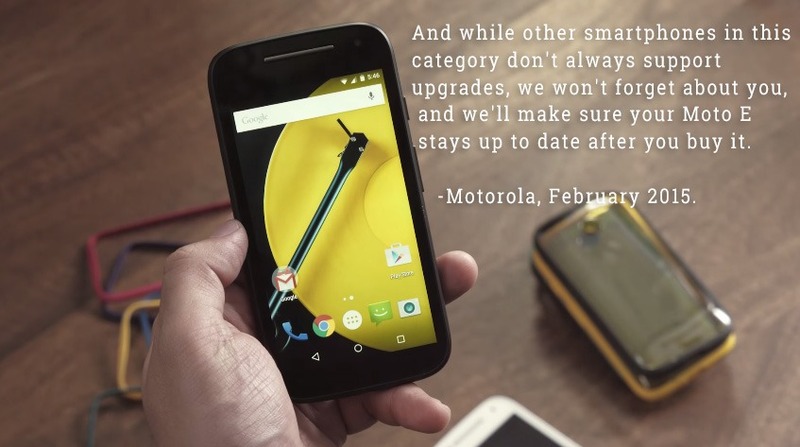 US Moto E 2015 owners, we're here for you with tissues, ice cream jars, loose pajama pants, and episodes of Gilmore Girls. You can cry and voice your shock and contempt and hatred in the comments below, then we'll watch TV and maybe cuddle under a blanket and roast some marshmalloooOOPS. Sorry, that was close.